Here is an update to the scene. I decided that I might change the lighting radically, even if it makes the image a bit dark—I'll probably tweak that with the compositing nodes later on. My goal is to achieve a classical chiaroscuro effect. 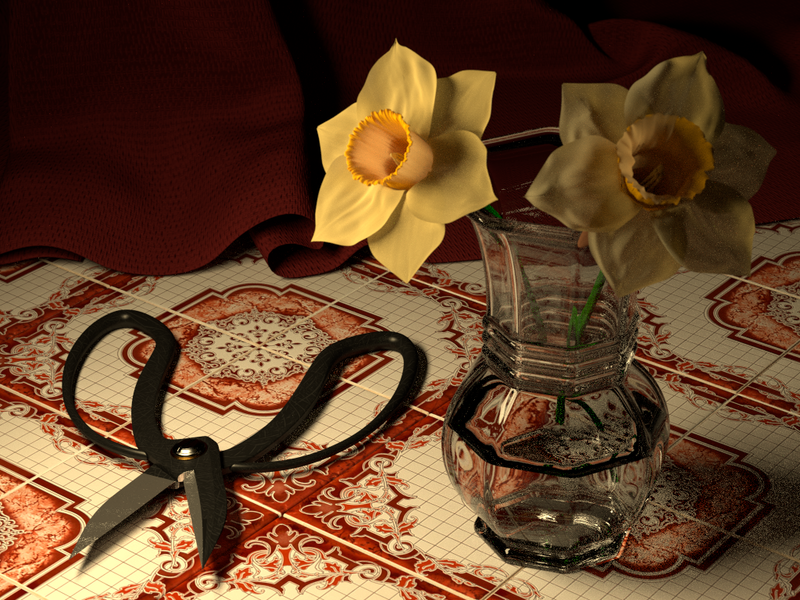 Rendered in Cycles at 500 samples. Its not a final render. Suggestions and comments more than welcome. I like the lighting in part II much better, especially the slight transparency on the petals. The scissor handles are distracting me, they are very flat with not enough relection to define their form or they are too pure black and the same colour as the shadow being cast. I can't quite put my finger on what is bugging me about them. I would agree that the lighting is more interesting in part II. 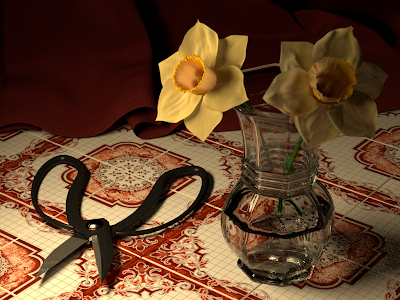 The textures on the flowers and the curtains in the background are more defined. the lighting is better, but the scissor handles are the wrong shape altogether. other than that, a beautiful scene!